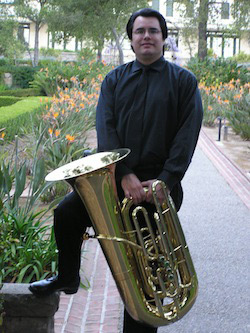 Ed Owen has been Principal Tuba of the Arkansas Symphony Orchestra since 2000. Born and raised in central Arkansas, the son and grandson of Missionary Baptist pastors, he began his musical studies in the children’s choirs of First Baptist Church in Bryant. He received the Bachelor of Arts in Music Education degree from Arkansas Tech University, the Master of Music in Tuba Performance and Doctor of Musical Arts in Performance and Literature from the University of Illinois in Urbana-Champaign. Dr. Owen is Professor of Music at Arkansas State University-Jonesboro where he teaches Applied Tuba and Euphonium and conducts the A-State Tuba Ensemble and Brass Choir. A dedicated and enthusiastic teacher, his students are regular participants in local, state, national, and international competitions. His orchestral engagements have included the Delta Symphony, Meridian Symphony, Champaign-Urbana Symphony, Great Music West Festival Orchestra, Sinfonia da Camera, Illinois Contemporary Chamber Players, and the Terre Haute Symphony. As a soloist he has appeared with the Arkansas Symphony Orchestra, the Delta Symphony Orchestra, the Arkansas State University Wind Ensemble, and the Symphonic Bands of Arkansas Tech University, University of Illinois, and Bryant High School. An active clinician, Dr. Owen is in demand for master classes and clinics on brass performance and techniques. He has studied tuba with Andy Anders and Mark Moore. Ed and his wife of 25 years, Delania, are the proud parents of Ashton and Isabella.